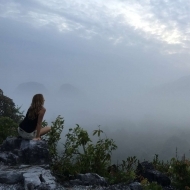 ​Borneo Ethical Adventures has built its business through connections established by its founder Alison Pritchard, who fell in love with Borneo and its people after living and working in Borneo’s Mulu National Park. Alison now partners with local businesses and people who share her ethos for protection and contribution. In doing so, she assures you of an authentic and meaningful journey into the mesmerising heart of Borneo. Borneo Ethical Adventures guides travellers into the pulsing heart of Borneo, giving you a taste of its major attractions while also revealing hidden treasures in vibrant backstreets and in the pristine depths of its jungles. You’ll never forget the spectacle of great flocks of bats filling the sky as they pour from Deer cave, or the enchanting feel of the jungle alive with dazzlingly coloured butterflies and birds and howling troupes of monkeys. Our grassroots adventures also offer you the chance to contribute to and connect with this natural wonderland and its people through volunteering. You may find yourself smitten by baby orangutans as you volunteer for a day with Project Orangutan. And you’re bound to experience heart-warming and soul-enriching encounters with locals as you turn your hand to projects such as painting village schools. As a longtime traveller and adventurer, I jumped at the chance to live and work in Borneo managing Mulu National Park and World Heritage Area. I’d spent my late teens and twenties roaming the world’s distant corners, before returning to Western Australia to live in the wild Kimberley region where I raised my two, now grown-up, beautiful boys. Back in the city in Perth, I enjoyed my job managing Yanchep National Park but yearned for more adventure. The job in Borneo’s Sarawak region was life changing. In all my life and travels I have never felt so connected to a land and its people. I fell under the spell of its wild reaches – immense jungle canopies home to a wild assortment of animals, from enormous butterflies to endearing orangutans and the hilariously designed proboscis monkeys. And the people! Never before have I encountered people so quick to welcome strangers, to truly connect with them and to warm hearts with their dazzling smiles. When the time came for me to leave Borneo, I vowed I would return and, when I did, I would come back and work for the people of Borneo – not them for me. I would get my hands dirty and bring others who share my passion to make a difference to lives and lands in this culturally, geographically, environmentally rich part of the world. When you book a Borneo Ethical Adventure with me, I will personally guide you to the places I have discovered after living and working in this mesmerising region.